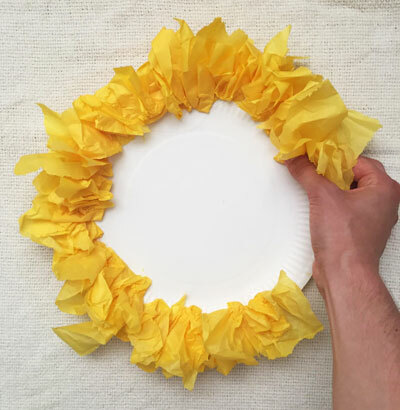 This is an adorable paper plate craft, which is extra fun with poofs of tissue paper. 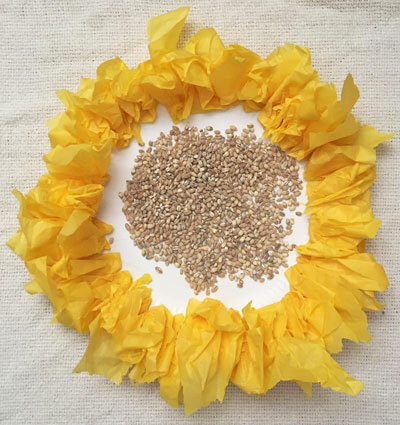 It can be made as a simple decoration for summertime, although I love to turn it into a maraca/drum by adding some shakey-bits (rice, dried beans, macaroni) to the inside! It makes a great instrument to accompany different songs/rhymes like "You are My Sunshine" or "Mr. Sun". 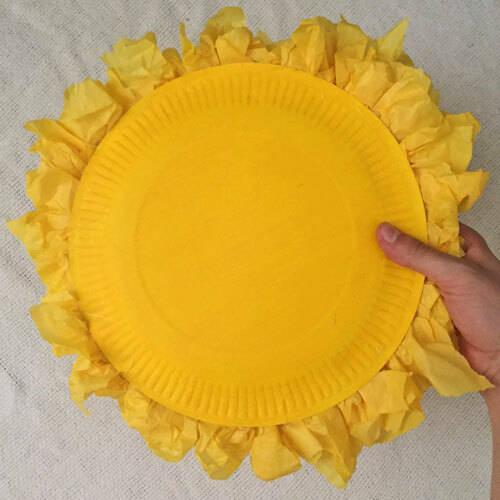 Paint the back of two paper plates yellow (it is a light color so you may need to do two coats) and let dry. Place one paper plate, bottom down, and cover the edge in white school glue. 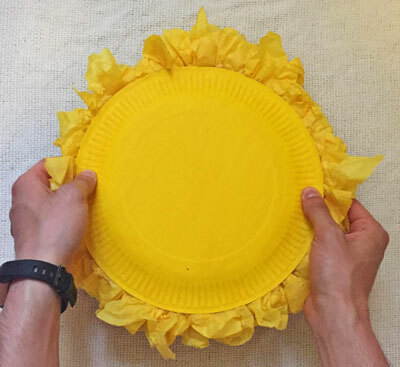 Crinkle up the yellow tissue paper so that it makes a sun ray type of shape. Place these piece all the way around the edge of paper plate. Let dry. 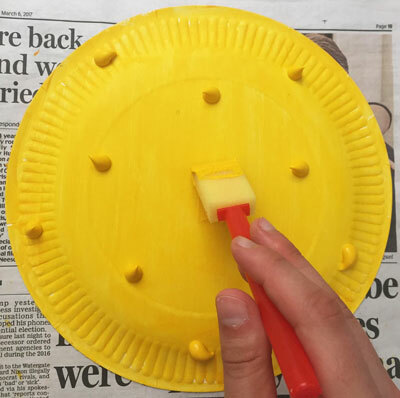 If you are turning the craft into a maraca, pour some shakey-bits into the bottom of the paper plate (I recommend using macaroni because it is a little bit bigger which helps it stay in the maraca). 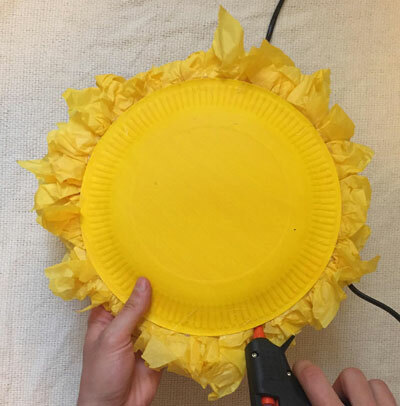 Take the second paper plate and place white glue around the edge (of the non-painted side) and sandwich the tissue paper rays between the paper plate. Press the edges together all the way around and let dry well. FOR AN ADULT: Once the maraca has dried, hold it above a newspaper (in case any bits fall out through this step) and hot glue a dab of glue inside and around the edges about an inch or two at a time and on either side of the tissue paper. This just helps to keep all of the shakey bits on the inside. 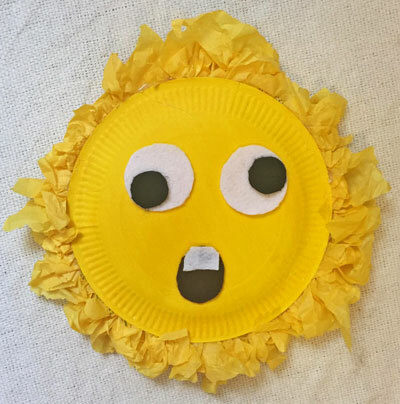 You can also draw on some eyes and a mouth, cut a face out of felt paper or construction paper, or add some googly eyes to give you sun a cute face!